I have NEVER eaten Whole Foods hot bar. b#2: There is never a Whole Foods around me when I need lunch. c#3: I keep hearing things about how the Whole Foods hot bar is riddled (riddled, I tell you!) with bacteria, and homie don’t play the salmonella game. I do play lots of other games, though. 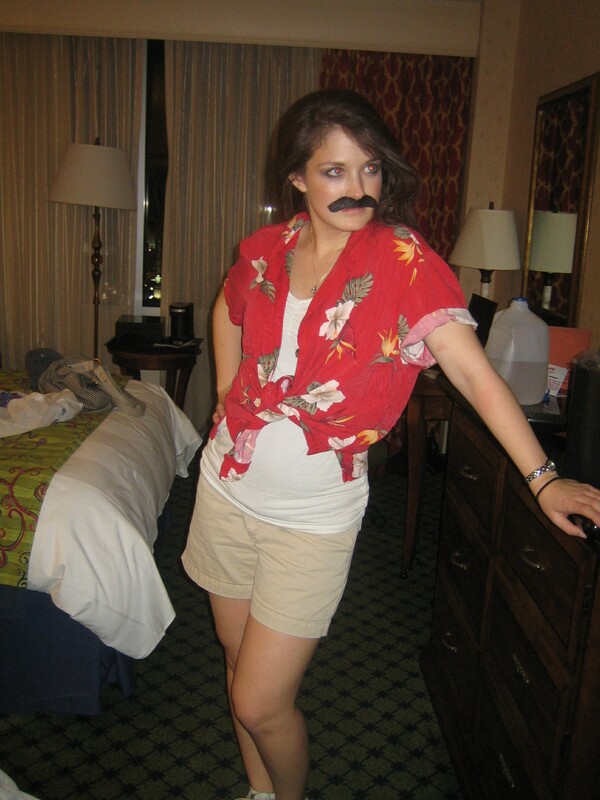 Especially if they involve moustaches. And I have to tell you- I’m all about normal grocery store salad bars. Sure, they may not be entirely organic (and yes, I realize that c#3 from above probably applies here, too), but they’re a fraction of the price and a pretty dang good option for lunch on the fly. Fruit, lots of veggies, choices of lettuce, protein and salad dressing (including a bottle of vinegar and a bottle of olive oil, plus salt and pepper). Salad bars can be treacherous, I’m not going to lie to you. You’ve heard the usual, “avoid cheese, avoid the sugary dressings, load up on veggies, yada yada”, so I won’t belabor the point. They weigh less than cheese and pasta salad. I like to think I’m a bit of an expert when it comes to composing a salad bar salad. I start with a big hunk of lettuce and then add a few veggies and vegetarian protein. Never the ham. Salad bar ham freaks me out. As well it should. Next layer is a bunch more lettuce, more veggies, more protein and sometimes a small scoop of pasta salad topped with a bit more salad dressing. 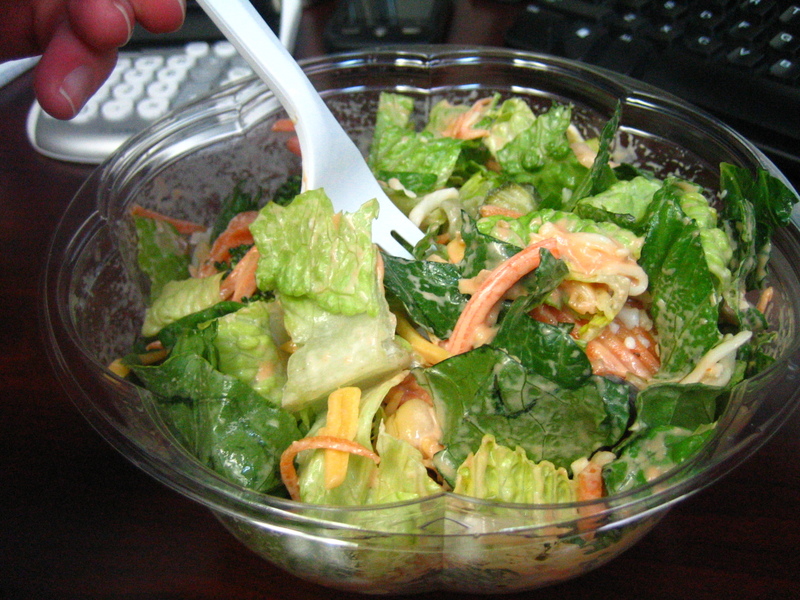 Today’s salad was romaine, carrots, chickpeas, shredded cheddar cheese, cabbage, zucchini, a few red grapes and some spiral pasta salad. The layering of the lettuce/veggies/dressing prevents the “I’m going to eat all of the interesting veggies first and then be stuck with a huge pile of boring lettuce” issue. Clearly I’m solving the world’s problems on my lunch break. 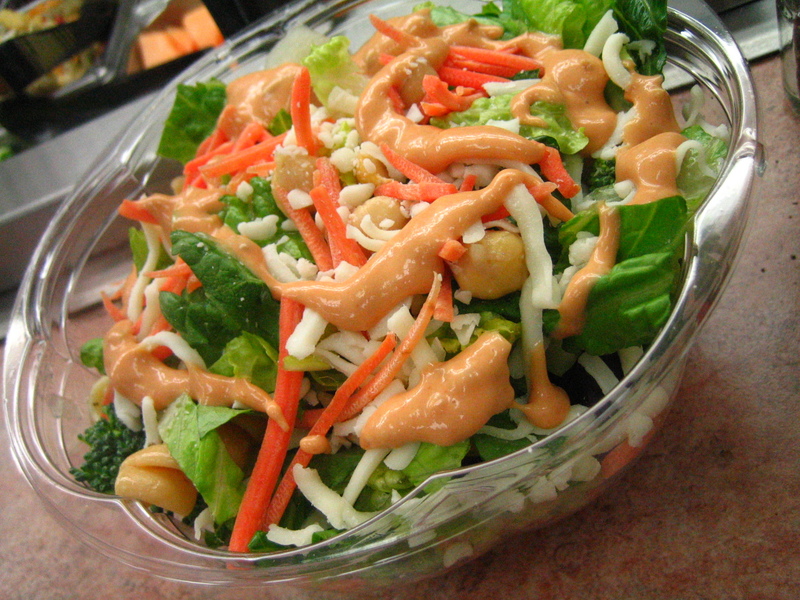 There’s one more thing that you absolutely MUST do when you build a salad from the salad bar. On your walk back to the office, shake the crap out of it. Your salad is now perfectly prepared for consumption. 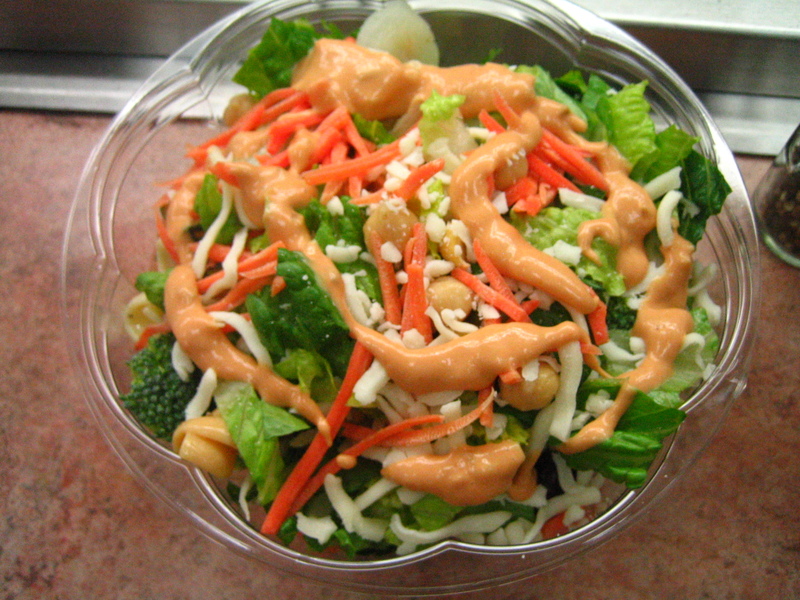 Enjoy your perfectly constructed, balanced and tossed salad! Anybody Want a Peanut (sauce)? I find it’s often smarter (not all the time, but most) to stay away from salad bar meats. The one in my office cuts up deli turkey and calls it a day. Whaaaat? Haha, I love this. I almost always get ranch dressing at a salad bar, so no judgement here. I love it and I don’t care about the fat. Honestly, the WF bar is almost too much. I always end up with too many random bits and it’s never as good as I thought it would be. Haha, I’m glad someone else uses the salad bar dressings. 🙂 It’s still better than going out for a burger eating questionable lunch meat, right? You are seriously missing out on the Whole Foods Salad Bar/Hot Bar/Dessert Bar. They are amazing. But I ALWAYS end up spending $12 on it… sooo you may have the right idea. But the closest Whole Foods OR Trader Joes is sadly far from me. And my office is near nothing 😦 Home-brung salads for me! I’ve never had a salad bar at WF either. HIGH FIVE! 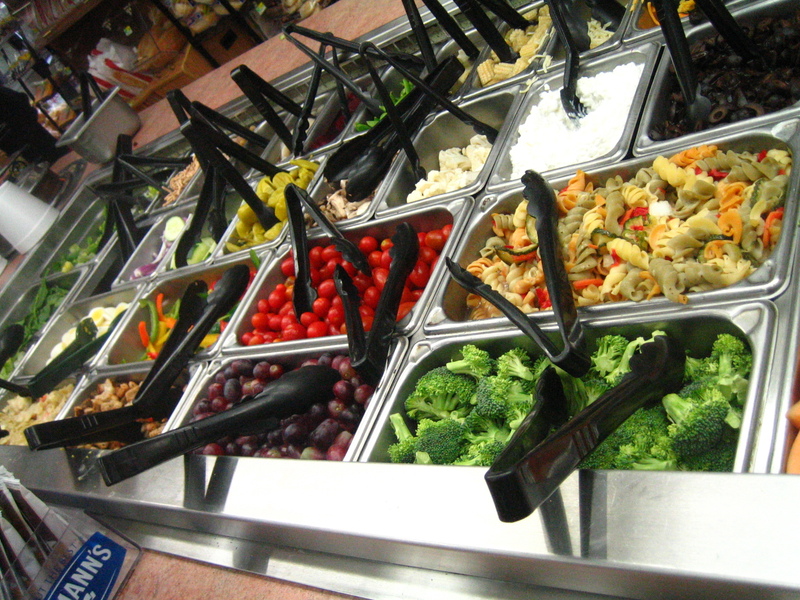 I am all about the salad bar, and love the layer method. I’m all over that next time. Also, I’m pretty sure that the veggies and such at the WF bar aren’t organic. I know at the local hippie store they aren’t. They don’t say anywhere one way or the other, but people just assume they are. which somehow justifies the ridonculous price. I do like Whole Foods hot/salad bar, and don’t mind other stores, but the one close to me doesn’t have very good variety and costs just as much. 😦 So I usually get a salad from Chipotle instead. The only reason the WF salad bar have such a close personal relationship is that I eat it a LOT when I’m traveling for work. When I’m on my own, I am alllll about the regular grocery salads! Love the layering idea, you’re brilliant!!! 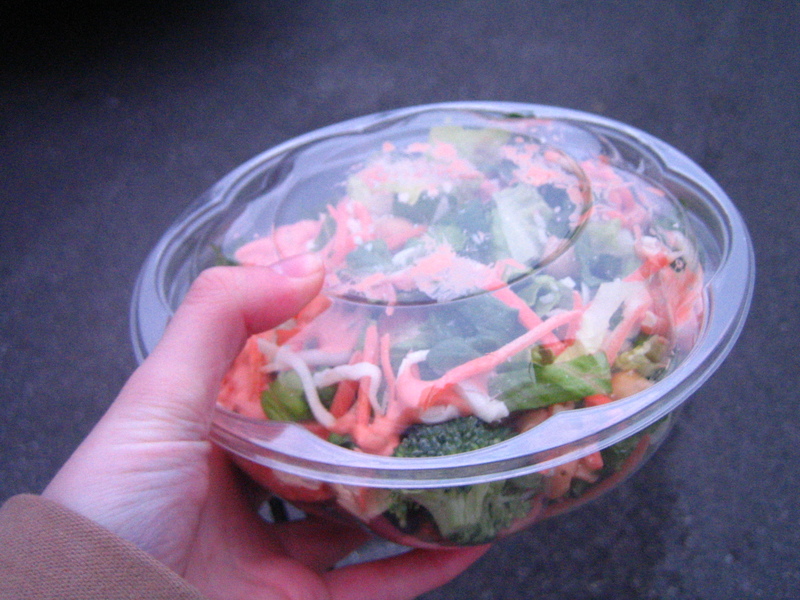 I’ve had the WF Salad/Hot bar once, totally not worth the near $10 I spent. I think I have decided that when I build a house (if/when/IF) I’m making a built-in salad bar. Stocked. I love having tons of variety for a giant salad like yours! I don’t care how much bacteria Whole Foods salad bars has. It’s too delicious. I’ll just wash it down with Kombucha to undo the bacteria I consume.